Amazon and other online stores have revolutionized the way we shop. No longer do we have to spend time walking aisle after aisle or driving across town to accomplish all of our shopping errands. We can simply search online and find what we need and, in many cases, get it within two days. Why should finding replacement window screens be any different? Instead of driving to the nearest home improvement store, why not shop for screens online? Even though you can’t “drive home” with your window screens the day that you shop for them online, the selection and convenience make buying replacement and custom window screens online, the best choice — especially when you shop with Metro Screenworks. Metro Screenworks offers an overwhelming inventory of window screen products that can fit your needs. What sets us apart? We offer to our New York customers complete customization of window screens as well as specialty products that do so much more for you than just keep the bugs out. The screens we provide can improve your home’s energy efficiency, withstand the effects of severe weather and the wear and tear of our pets, or retract out of the way. We offer high-quality window screens whether they be traditional fiberglass or a specialty material, that are unbeatable in quality. 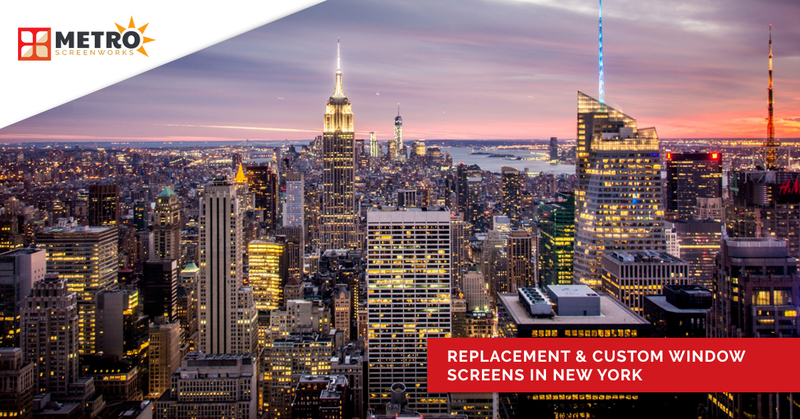 Metro Screenworks has been retailing custom window screens and serving our customers in New York for over 35 years. Located near Denver in Englewood, Colorado, we ship all over the country, providing same-day shipping of quality-guaranteed products and excellent customer service every time. When you shop with us you get the options that you deserve and that your local home improvement store can’t provide. Shop our online store online to see for yourself. Have questions about any of our products, wholesale discounts, or getting a sample? Contact us by emailing, calling, or chatting with us. Shop our screen store online. If you have never seen specialty window screens, you may not understand why having so many options is important. You may be asking: why should I invest in specialty screens? Doesn’t fiberglass or aluminum screen that is sold at my nearby home improvement store work just fine. Yes it does, but with our specialty products you can get even more out of your screens. As we mentioned above, our specialty screens provide benefits like protection from harmful and destructive UV rays and pollution, and a crystal-clear “screenless” view. With our window screens, you can make them work for you. Bottomline: You get more for your money when you invest in specialty, custom window screens. There are many parts of our home that we forget exist until they stop working and our screens are just one of those parts. The time when we most appreciate our screens is usually when they are torn or damaged and we start experience the annoyance that flies, mosquitos, and other pests can bring. With this in mind, even though it may be tempting to forgo replacing your window screen, window screens can actually protect and enhance your health. Screens are a fairly recent inclusion in American society. Screens started to first appear in the U.S. during the Civil War. A lightweight screen material that was used to package cheese was reused and nailed on open windows to keep bugs and other pests out. With the use of screens, the rapid spread of disease slowed and some diseases became almost non-existent in the U.S., all because of the use or the simple, but highly effective window screens. Read more about the History of Screens. One of the main specialty window screens that we offer is called invisible screen which is exactly what it sounds like: place invisible screen on your windows and instead of seeing the screen out your windows, enjoy the view. Whether you have cityscape or thick forests as your backdrop, invisible screen can allow you to better enjoy that million-dollar view. BetterVue and SeeVue invisible window screen can be installed in our complete, custom-made window screens or is sold by the roll so you can use it easily at your own convenience for your screening projects. One of the biggest deterrents for opening our windows is what can float through our screens and into our homes. Pollution, smog, and allergens can, unfortunately, make their way into our home and wreak havoc on our health. However, if you use air filtration screens that all changes. When you install Respilon Air and Air Filtration Window Screens, clean air flows through your screens while other substances are left outside. Say goodbye to stale inside air and to the agony of allergies and enjoy crisp fresh air with our invisible screens. No matter who you are, we all want to save a bit on our bills, especially our energy bills. With solar screen you can. Solar screen comes in a variety of strengths and offers protection from the sun’s heat and UV rays. Not only can this lower your interior temperatures, but it can also let you run you AC less often. Sun is also one of the most destructive elements for your interiors. It can cause cracking, fading, and general deterioration. By installing a solar screen, you can protect the longevity of your home. Your pet might have to find a new sunny spot to enjoy, but you can have peace of mind knowing that your home is protected. We love our pets. They are our cute, furry companions no matter if we are having a good or bad day. However, they can put a lot of stress on our window screens. From their clawing the door to get out to climbing window screens and running through the screen door, they can inflict quite a bit of damage on our screens, causing you hours of repair work. Pet screen is seven times stronger than traditional screen and made to withstand the wear and tear. This vinyl-coated screen can be installed in your window screens and screen door. We also offer a pet screen door! Shop our online screen store to learn more! One thing that you will find out when you shop with Metro Screenworks is that there are no limits to what we can provide. Though having a permanent screen on your windows can provide energy-efficiency, in some cases it can be more beneficial to have your screens up and out of the way. Want to screen in your porch, but the HOA won’t allow it? Install retractable screens! You can still abide by their rules, but also enjoy the pleasure of a screened-in porch. Learn more about the options that retractable screens provide and shop our selection online! A window screen is only effective if it fits in your window. A window screen that is too big most likely won’t fit in your window and one that is too small won’t do any good against the will of flies, mosquitos, moths, and other pests. So, before you order your new window screen for your home in New York, be sure that you have measured your old screen or screen-less window properly. If you have never had to replace a window screen, then it may seem a little intimidating figuring out what window screen you need. However, there is no need to feel intimidated. All you need is a pen and paper, measuring tape, and expert advice which we can provide. If you have questions feel free to contact the screen experts at Metro Screenworks! We would love to help you get the screen that you need. Measure the old window screen to the nearest 1/16 of an inch starting with the shortest side. Measure the remaining long side to the nearest 1/16 of an inch. After you have measured the old window screen, next it’s time to figure out what screen hardware you need. Choosing Your Replacement Window Screen Hardware. If you don’t have the original screen, getting the measurements for your new screen is a little more involved. Follow the instructions below or contact the window screen experts at Metro Screenworks! First, you must find the lip of the window screen channel, then measure up to the channel above. After you’ve measured, subtract ⅛ of an inch. Next, measure the horizontal channel and then subtract an ⅛ inch. Most window screens can be measured this way. However, not all windows are created the same and require a different way of measuring them. Once you’ve gotten the measurements for your window screen, it’s time to take a look at the hardware needed to install the screen. Making sure that you order the right size of screen and the right hardware is crucial for getting a screen that will fit in your window. If you have questions about replacing your window screens, contact us! The window screen experts would love to help you get the screen that you need for your New York home. Contact, call, email, or chat us today!